There are cases that occur all the time where an examination of the victim's body can't determine which bullet hole is the entrance and which is the exit. Pretty critical when witnesses are saying something like, "The police officer came up behind my cousin and shot him in the back!" When the body offers no evidence of bullet entrance and bullet exit, firearm examiners will be called upon to examine the victim's clothing. When a bullet strikes an object, such as clothing, a bullet entrance hole is created and in a lot of cases the bullet will pass through the object and produce an exit hole on the backside. Bullet entrance holes typically have very even margins. Almost all non-contact bullet entrance holes will be smaller in diameter than the bullet due to the elasticity of the fabric. Some firmer materials and larger caliber bullets with large hollow point cavities may cause bullet entrance holes to be closer to the actual bullet's diameter but in most cases the diameter of the bullet entrance hole will be of little help in determining the caliber of the bullet. Typical bullet entrance hole in a holster. Contact or near contact entrance holes and entrance holes caused by a bullet that has struck an intermediate object will typically have very uneven margins. Contact entrance holes will typically show extreme damage to the material of a garment. Generally speaking, the higher the velocity of the cartridge the greater the damage to the garment in a contact gunshot. When a bullet strikes an intermediate target (for example the victim's arm) before entering the victim's shirt it may cause the bullet to fragment, expand, or even tumble. The resulting secondary bullet entrance hole can be very irregular in shape and hard to visibly distinguish from an exit hole. Subsequent testing for gunshot residues usually help in making this type of determination. struck a windshield prior to entering the garment. 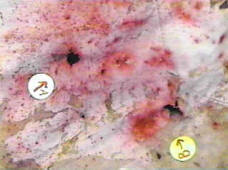 Very irregular holes with fragmentation and lead spray (pink). Bullets that strike a target at an extreme angle will usually leave an elongated hole. These holes typically will still have fairly even margins. It's not too uncommon for a grazing bullet to cause several holes in a wrinkled or folded garment. Angled grazing bullet holes made by a single bullet. A common characteristic of bullet entrance holes is the presence of bullet wipe residue. Not always apparent on darker colored materials, bullet wipe residue is a darkened ring around the immediate margins of the hole. This ring of residue is caused by lead being wiped from the surface of the bullet as it passes through the material. Lead bullets normally leave the heaviest deposits of bullet wipe residue but it is not unusual for jacketed bullets to also deposit bullet wipe residue. Lead fouling in the barrel and lead primer residues can be on the surface of a jacketed bullet. of a lead bullet entrance hole. Chemically processing a garment for lead residues will cause a pink reaction around the hole. Bullet wipe residue after chemical processing. Bullet exit holes are really not much to talk about. Full-metal-jacketed or round nosed bullets may leave holes that are similar to bullet entrance holes but most will be absent of bullet wipe residue. If bullet wipe residue is present it will normally be very light and on the inside of the exit hole. Bullet exit holes caused by fragmented or expanded bullets usually have irregular margins and it's not too uncommon for the bullet exit holes to be larger in diameter than the original diameter of the bullet. Fragmented bullets will typically grab the material of an object as it passes through causing the material to be frayed outward. Once the bullet holes have been examined and fully documented, it's time to start looking for evidence that may allow for a distance determination to be made.